Here comes the train. 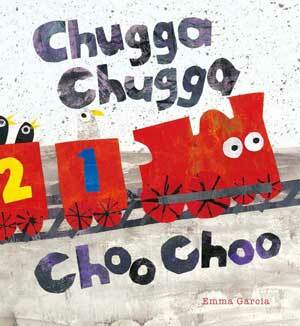 And it’s rolling down the tracks in this vibrant picture book! Follow it along and count the birds that join the trip. All aboard, and all join in as the cheerful little train chugs past the seaside, the farm, the forest, the city, and into the station for a nice long rest. Along the way, a flock of noisy seagulls and blackbirds, pigeons and geese hop on for the ride. Kids will have fun looking at Emma Garcia’s colorful, collaged landscapes and counting all the honking, cooing, tweeting birds. Hardcover, 10 x 11", 32 all-color pages. Ages 3-6.